The recording of “Going, Going, Gone” is definitely soaked in an atmosphere of acute desperation. Maybe they turned the air-conditioner off for this one, because the guy really does sound like he is “hanging on the ledge.” And though Robertson again excels himself, it is all about Dylan’s frayed performance. Except for the immediate “Forever Young” (anyone with at least some brain cells set aside for music.. loves this one), I feel the key to loving this album is to “get” the sound… Dylan & The Band creates a wonderful & complex mood…. it grows on you…. and when you’re in… you’re in for life! One of Dylan’s most underrated albums.. Planet Waves is the fourteenth studio album by American singer-songwriter Bob Dylan, released in January 1974 by Asylum Records (Island Records in the United Kingdom). 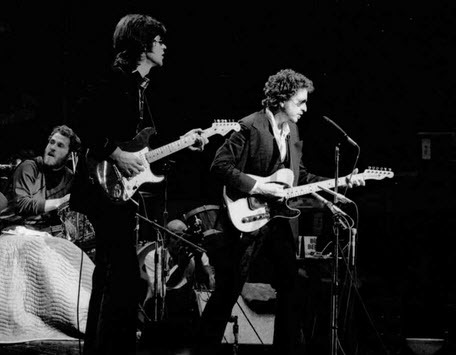 Dylan is supported on the album by longtime collaborators The Band, with whom he embarked on a major reunion tour following its release (documented on the live album Before the Flood.) With a successful tour and a host of publicity, Planet Waves was a hit, enjoying a brief stay at #1 on the US Billboard charts—a first for the artist—and #7 in the UK. 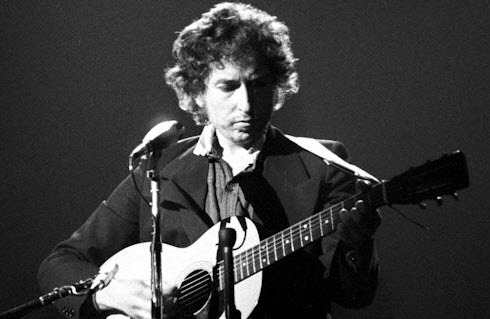 Critics were not negative, as they had been with some recent Bob Dylan albums (namely Self Portrait and Dylan), but still not enthusiastic for the album’s brand of laid-back roots rock. 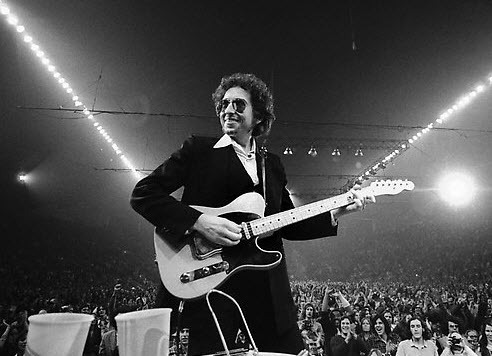 The album was originally set to be titled Ceremonies of the Horsemen, a reference to the song “Love Minus Zero/No Limit”, from the 1965 album Bringing It All Back Home; the release was delayed two weeks when Dylan decided to change the title at the last minute. The cover art is drawn by Dylan himself. Written on the right side of the cover image is the phrase, “Cast-iron songs & torch ballads,” apparently signaling Dylan’s own conception of the album. On the left side is written “Moonglow”, which is sometimes interpreted as a subtitle. 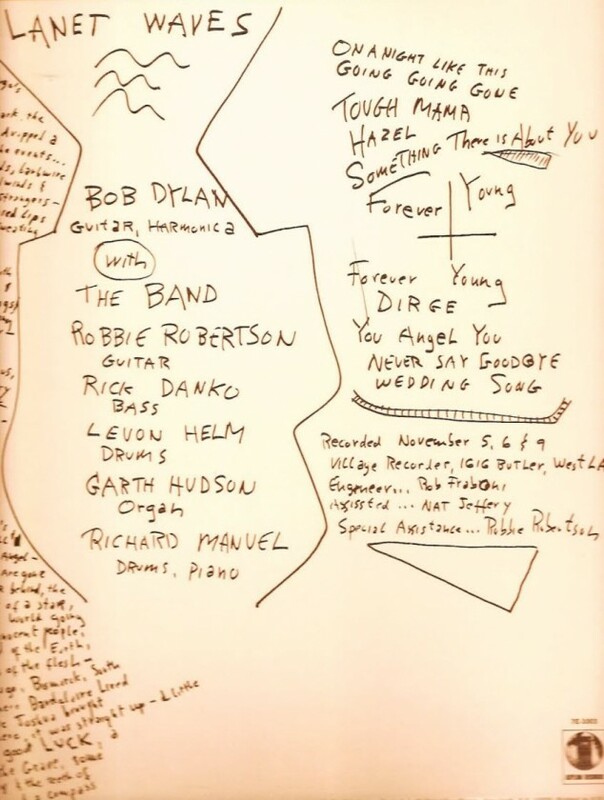 The initial release also included an insert which reportedly set out excerpts from Dylan’s personal journals. 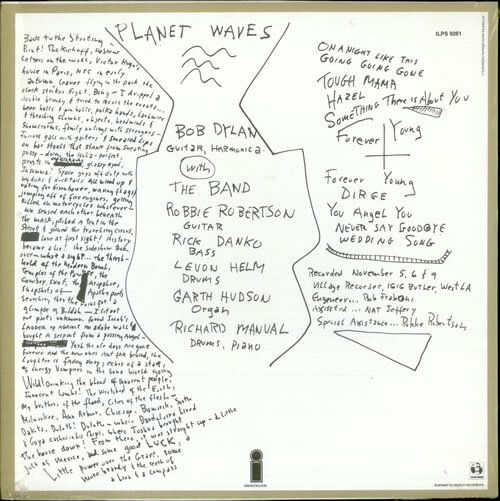 Planet Waves was Dylan’s first ‘proper’ album in three and a half years. With a planned tour to follow (his first since 1966 and backed by the same band that supported him on that legendary tour), the media coverage was enormous. Asylum Records planned on releasing Planet Waves the same day the tour began, but an album title change (from Ceremonies of the Horsemen) and a last minute substitution in liner notes (also written by Dylan) pushed the release date back two weeks. The critical reception was generally positive, if a bit muted. …For the first ten minutes after it came out, this 14th Dylan album was hailed—as New Morning had been—as ‘the best thing he’s done since Blonde on Blonde’. Like New Morning, it then suffered a disappointment backlash from which it never fully recovered. Put in the long back-projection of Dylan’s recording career it now seems a potent, open album. Warm, musically sumptuous yet tense, and emotionally rich, it points down no new road; asserting the artist’s right to prefer minor work on old canvasses to doing no work at all, it is drawn from the inner resources of memory and a determination to record faithfully the artist’s current state of mind in spite of tiredness, an unpopular grownupness and some lack of self-confidence. I personally could could have done without the fast version of Forever Young. It makes no sense to have 2 versions on the album when a song of such beauty is left off. It all suggests the Album was rushed and not thought through properly. Just simply want an expression of personal preference? Planet Waves makes the cut if I had to let go of a lot of my CDs. I’d keep Planet Waves, Good As I Been to You, Love and Theft, World Gone Wrong, Basement Tapes, Shot of Love, John Wesley Harding, Saved, and New Morning. Before I’d let those go I’d let of Blonde on Blonde, etc. Now throw me to the wild dogs. One of my favorite Dylan records! His only studio record with all the members of “The Band” their tightness really stands out. No back up vocals needed here as Dylan’s voice is clear and strong. Back up vocals would have taken away from that. Dylan’s harp, Robbie’s guitar, Garth’s organ, etc…….. all sound great individually and collectively to create a beautiful sounding record that sounds fresher with each passing day and remains forever young. This record stands on its own, but I believe also set the ground work for his follow up records, Blood On The Tracks, and Desire. I read somewhere that Going, Going, Gone is derived from the haunting I’m Not There from the Basement Tapes, a song never defined nor even transcribed as far as I know. Did anyone else hear that? DIRGE is the main CAST IRON item here; if you don’t believe me, just go ask Dylan. As for his liner notes, these used to be little highlights on their own. Alas, they’ve faded to simply blank or black in recent albums. i Agree its underrated and sounds slightly rushed but its really good album and have alwaye felt that the slow version of FOREVER YOUNG could have done with the Bands harmonies on the chorus (like at the last waltz) but thats Bob for you. Sorry, but again I don’t see how it’s great, other than if you’re being a sycophant. As for it being better with more time, just look at how much better “freewheeling” or “Blood on the tracks” we’re because of extra work. The only album that Dylan had up until “Slow Train” that didn’t need extra work was “John Wesely Harding” . This is what’s it’s all about.. OPINIONS .. I think “Planet Waves” is great.. .. you think it’s good… I respect your point of view. What is with the peace sign on the cover? You would think Dylan would know how to draw one. Maybe it is a Mercedes hood ornament and Dylan is making some other kind of statement. Blood On The Tracks and Planet Waves are Dylan’s are the two albums that give us a glimpse into his soul at those moments in his life. They are his most personal records and therefore – in my opinion – they are his two top albums. 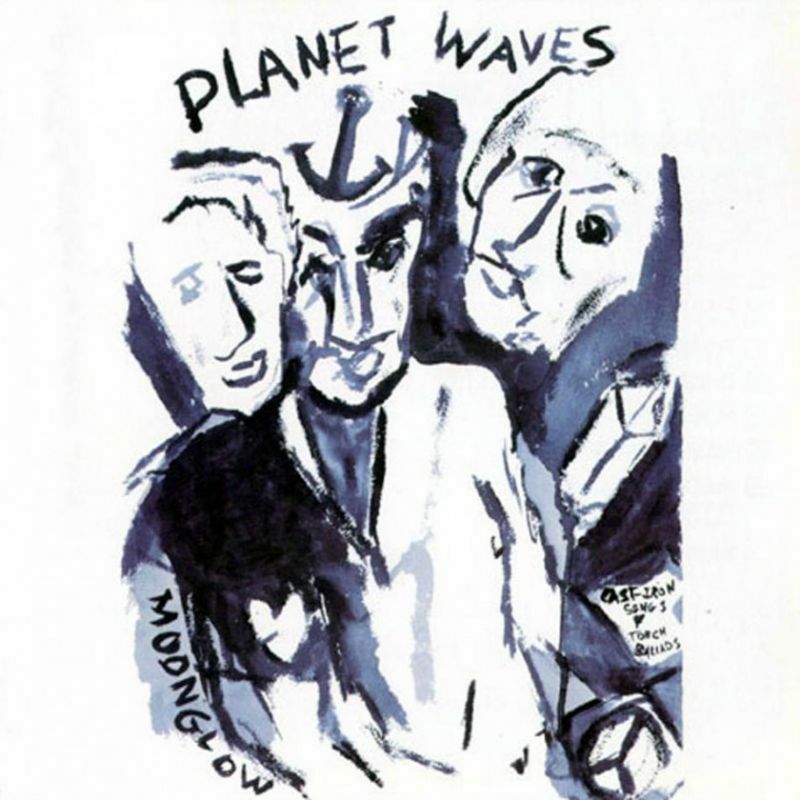 I don’t care if Planet Waves sounds ‘rushed’ or could have used some Band vocals – Planet Waves takes us on a tour of Dylan’s heart and soul. “I hate myself for loving you…” That line alone is more personal than anything on Blonde on Blonde. Or “I paid the price of solitude but at least i’m out of debt”. And the fact that Dylan wrote “Forever Young” to his newborn child… WOW… I got a stuffed frog for my daughter’s crib – he wrote Forever Young… Planet Waves is an emotional roller coaster ride and it is a wonderful and painful journey. 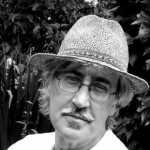 .. he wrote “Forever Young”…. I got a stuffed frog.. priceless. It’s the only full-length studio collaboration between Dylan & The Band, we’re lucky to have it. While it has some fine songs, it nevertheless sounds rushed, and it was. Some of the songs sound like the first or second runthrough, and could have benefitted from a bit more work on them. Of course, some will say “I love the spontaneous nature of the songs”, but to me it comes across as somewhat sloppy, and that’s why it’s a good album, and not a great one. It sure was kind of rushed… some songs were hardly rehearsed at all (among them “Dirge”).. but I love the way they sound. Maybe the songs would have benefitted from some more studio time or Dylan-alone time… but on the other hand.. maybe not. It’s kind of ironic that Dylan’s first #1 LP is considered somewhat of a “sleeper” in his extensive catalog. 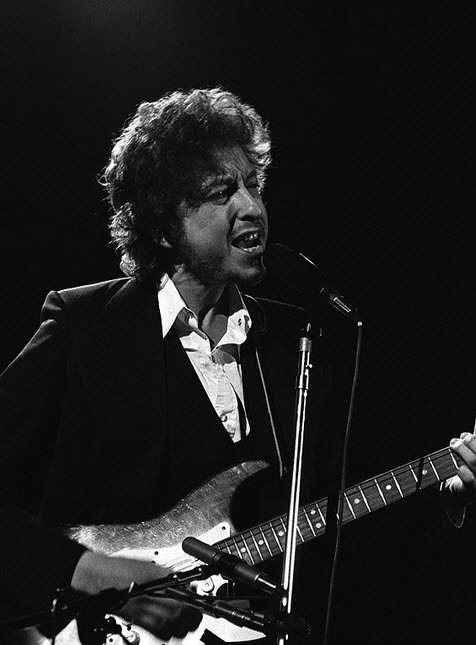 Over the years, Dylan has sometimes commented that some of the songs were not quite complete when they were recorded, due to the deadline for release before the tour. Nevertheless, Planet Waves features some truly outstanding songs — “Forever Young,” “Going, Going, Gone,” “Something There Is About You,” “Dirge,” and “Wedding Song.” And, of course, with this lineup the performances are knockout. The one thing that holds the LP back from the top tier of Dylan albums is the stunning absence of backing vocals by The Band. It’s a shame that Danko, Manuel, and Helm’s amazing blend of voices remain silent throughout. I agree.. backing vocals from Danko/Manuel/Helm would probably have lifted some songs.. I ‘m not sure if backing vocals would have brought much more on Planet Waves. Given the intimate character of the album, the very personal lyrics, I think it was very well done this way. i have always thought this was the best bob dylan album. after a such a long period of silence bob seems to enjoy making music again and men are that they should have joy. If Planet Waves should be one of the most underrated records of Dylan, the DIRGE has to be its most underrated, well, dirge. In an age of fiberglass, I’m searching for a gem. Think hard on just that one line.